The East Fishkill Historical Society is committed to safeguarding the cultural heritage of the Hudson Valley, particularly East Fishkill, through the restoration, preservation and interpretation of its Dutch colonial farmhouse and its collection of local material culture. Through education, the Society hopes to develop and foster an understanding of East Fishkill's history, while encouraging the community to appreciate and care for East Fishkill's past, present and future. In March 1960, Mrs. Charlotte Cunningham Finkel convened a meeting of a group of citizens interested in local history. 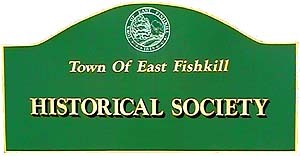 At a second meeting, in April, they decided to form an association to be know as the East Fishkill Historical Society. The first formal meeting took place May 1960 at the East Fishkill Town Hall. Dues for individual members were set at $1.00 per year. In November of 1960, the Society decided to have its official seal designed featuring the beautiful Emmadine Oak Tree, which had been cut down the previous January. Mrs. Minor McDaniel volunteered to make the drawing. The New York State Board of Regents granted the Society a Permanent and Absolute Charter in December 1961. The Society held its meetings in the East Fishkill Town Hall up until 1975 when Gustav Fink donated to the Society what today is know as the Brinckerhoff-Pudney-Palen House. Members of the society donated both time and money to restoring the house and today it is a beautiful mid-18th to early 19th century house to which all of its members can point with pride. Significant contributions have been made by the Town of East Fishkill, the IBM Corporation of East Fishkill, Adeline and Elton Bailey, Sr., Dorothy Cunningham, Rita and Cole Palen, Jr., Louise Macy, the Fanny Van Wyck Boos Trust, and Martha Cestone. Rescued from vandalism and decay in the early 1980's, the Brinckerhoff-Pudney-Palen House stands as a model of Dutch colonial architecture, of the 18th century. This old farmhouse located on North Kensington Drive off of Palen Road in East Fishkill has now been returned to its former state of grace and elegance. This structure, at present helps us to imagine life at the beginnings of a community here in East Fishkill. The year was 1718, and Madam Catherine Brett was beginning to offer her lands in Dutchess County for sale soon after her husband, Roger, drowned in a storm on the Hudson River after being knocked overboard from his sloop by one of the booms. One of the first large purchasers was Dirck Brinckerhoff (1667-1748) of Flushing, Long Island. He bought from Madam Brett a tract of land of 2,000 acres lying along the "Vis Kill" (Fishkill Creek) from Fishkill village to Sprout Creek. Captain's John G. Brinckerhoff and George G. Brinckerhoff were brothers in one of Dutchess Counties local Militias. 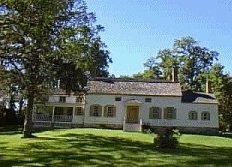 John conveyed to George the 213 acre farm on the south side of the "Vis Kill" on which the original east wing of the Brinckerhoff-Pudney-Palen House stood, built during the last half of the 18th century. This wing, which at the time was the entire house, consisted of a kitchen with a large fireplace and oven, a steep staircase to the single room upstairs, a Dutch door, and a covered, enclosed porch attached to the house, reminiscent of medieval architecture. The Brinckerhoff's probably built the center gambrel-roofed section constructed sometime around 1783. This, the largest section of the house contains an exquisite foyer/hall graced by subtle yet elegant architectural features. The home is one of only two gambrel-roofed houses remaining in East Fishkill, preserving for posterity the unique style, which was popular during the period of 1750 to 1800. The small pained windows, enclosed staircases, Dutch doors, built-in coat racks, and wrought iron "HL" hinges were characteristic of the 18th century, making the house an architectural treasure. George G. Brinckerhoff died in 1812, and in 1814, the 213 acres was sold to Obadiah Bacon and Thorn Pudney, both of Fishkill. A year later the Bacon interest was purchased by Pudney, and the farm was christened "Arcadia" as it appears on the 1867 map of East Fishkill. For the next 60 years, it remained in the Pudney family. The Pudney's are undoubtedly responsible for the addition of the four-room western wing of the house, added circa 1830 . This addition featured a small summer kitchen complete with fireplace, crane, and brick oven made at Fishkill Landing. A stone water cistern was constructed in the cellar beneath the kitchen to collect rainwater. A window pane bears the name "Letitia C.Pudney" etched into the glass and Jacob Pudney's name is painted on the wall above the grain bins in the gambrel-roofed attic. In 1875, Edward Palen purchased "Acadia" and he and his son-in-law, William Bogardus changed the character of the farm by focusing on dairy production. Later run by James H. Palen, Edward's Son, the farm had in addition to the usual animals, about 60 milking cows, and was well equipped for the time period. The Palen farm was self- sustaining even producing the trees, which James Palen sawed into lumber using a horse powered treadmill saw. The lumber was used by James to build a barn. Another treadmill, this one dog-powered, was located in the cellar to operate the butter churn.. The farm continued as a dairy farm until 1926, run first by Edward and later by his son, James H. Palen. Due to James Palen's failing health, the farm was sold to Banton Moore on December 4, 1926. Gene Satterlee rented the property for many years and continued dairy farming until the barn burned. Later the property was sold for a final time to Gustave Fink who purchased it from the Moore estate in 1974 and donated the Brinckerhoff-Pudney-Palen House and three acres to the East Fishkill Historical Society in 1975. Also located on the property are four other historic structures. There is a Carriage House circa 1840 moved from the Theodorus Van Wyck estate off Route 52 in Hopewell Junction. This carriage house was dismantled, numbered and put back together as it originally stood. IBM funded the project. Upper Hopewell School #9 circa 1826 moved from Beekman Road and the Taconic Parkway in 2000. The circa 1870 Rapalye Ice House, and the John Hyatt Blacksmiths Shop circa 1880, moved to the site in 2014. These projects were funded with assistance from the Town of East Fishkill, private donors and membership donations. The East Fishkill Historical Society welcomes the community to visit the Brinckerhoff House Historic Site during their Open Houses and special events throughout the year. The Society holds an annual Strawberry Festival, Farm Day, Lecture Series, and Holiday Open House. Our events calendar can be found on our news page. The Society also maintains an active Facebook page where we post our upcoming special events, including special performances, children's programs, special exhibitions, and celebrations. Brinckerhoff House Historic Site/Home of East Fishkill Historical Society. The Society is always looking for new members and/or volunteers to support the restoration and preservation of the history of East Fishkill. A general membership is $15.00, Family is $20.00, Contributing is $35.00 and Patron is $100.00 or more. The Society publishes a quarterly newsletter for its members. Donations are tax deductible and can be mailed to: The East Fishkill Historical Society, P.O. Box 245, Hopewell Junction, NY 12533. Group tours, including those conducted for school groups, are available by advance registration. Nominal admissions fee for group and school tours, all other visitors are admitted free. The lower floor is handicapped accessible.